Originally published 19 April 2016. 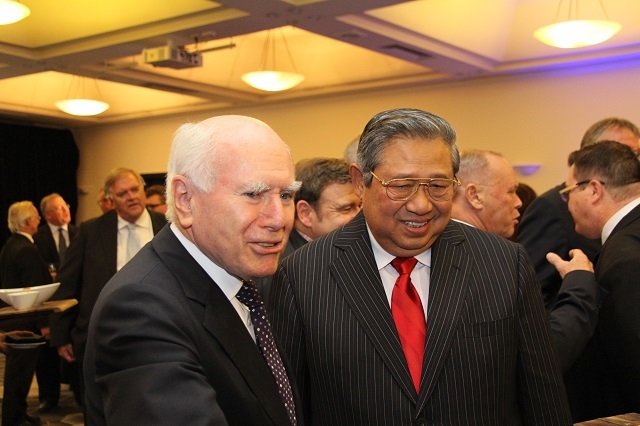 For those privileged to attend the second day of ASPI’s Defence White Paper: from the Page to Reality conference on 8 April 2016, the address by the former President of Indonesia Susilo Bambang Yudhoyono  was galvanizing. SBY spoke with conviction, enthusiasm and optimism about the strategic potential immanent in the bilateral relationship. Former Defence Minister Kim Beazley’s reply from the floor was no less stimulating for his powerful sense of Indonesia’s critical place in Australia’s long term prosperity and security—and, one should note, for his recognition of the central role that SBY played in the restoration of an effective bilateral relationship during his presidency. If only their views were shared by those who lead our government and our Foreign Affairs and Defence organisations. For all the elegant rhetoric of Ministerial speeches  and the noble aspirations of the Defence White Paper itself, words remain exactly that: words. To put substance on the bones of sentiment demands understanding, alignment and action—things that are in short supply when it comes to operationalising our foreign and defence policies. Complacency is the enemy of opportunity, especially when it’s comfortably cushioned by the smug, self-satisfied superiority that distinguishes Australia’s approach to all things Asian. So long as we can preach to the region, there’s no need for us to listen to our neighbours, to understand their cultures or to converse with them in their own languages. SBY’s audience listened attentively as he delivered his beautifully crafted speech in nicely articulated English. But not a single senior member of the government or the opposition, not a single secretary or public sector leader, not a single service chief was there to listen. One wonders whether President Bill Clinton, had ASPI been able to secure his contribution as a speaker, would have been so ignored by our government and public sector elite. Australians like to think that we can leverage ‘the Asian century’ by talking about how capable we are, the remarkable amenity we enjoy, and about the need for regional nations to honour human rights and observe the international rules-based order created for them by the distribution of power in the post WW2 world. We want to prosper on the back of Asia’s need for raw materials, food and, increasingly, services—on our terms. But what we’re actually demonstrating is a kind of institutional ignorance that pays no attention to the linguistic and ethnic diversity of our neighbours (just as we pay lip service to our own), preferring instead to remain defiantly monolingual and stubbornly unaware of their cultural sensibilities. As the Asian Century White Paper  (PDF) pointed out, the study of Asian languages has been on the decline for two decades, except among children with an Asian background—a fact to which Michael Wesley drew our attention five years ago . The Asian century offers extraordinary promise, both to the peoples of Asia as they move from poverty to affluence, and to us as we partner them on their journey. But to realise that promise, the nations of Asia need participative political systems and open economies, which will happen only to the extent that their political, economic and legal institutions are robust and transparent. That means working beyond the western-educated elites that tend to form the political superstructures of regional governments to engage with the emerging middle class—the business leaders and emerging capitalists, the public servants, and the specialist service delivery entrepreneurs such as accountants, architects, bankers, economists, engineers, educators, health service deliverers, importers and manufacturers as they leverage Australian know-how to improve the lives of their fellow citizens. To do that, however, means speaking their languages, understanding their cultures, and embedding ourselves in their new economies. For Australia, this’s a deeply strategic issue. The prevailing orthodoxy, however, would have them come to us—to learn and absorb—in much the same way that Australians in the early 20th century went to Britain. That has to be turned on its head: we must go to them—to coach and mentor, to engage and partner. With PNG, Indonesia is our closest neighbour and our most important. Indonesia recognises that fact, just as it recognises that Australia has the capacity to play a constructive role in its own political and economic development. SBY is without doubt Australia’s greatest strategic asset in Indonesia, not simply because of his intelligence and goodwill, but because of his imagination and vision. He understands our mutual history, with its ups and downs. More importantly, he appreciates the breadth of the opportunities presenting themselves to both of us. To deliver on those opportunities, we need to build a sense of common enterprise, whether through education, scientific cooperation, security collaboration, capacity building, institution strengthening and, importantly, the nurturing of ties between our parliaments. Truculent insularity is no substitute for respectful engagement. That starts with knowing who our friends are, extending to them the respect that’s demonstrated by showing up and listening when they take the trouble to talk to us. And, by the way, it would really help if we could talk to them on their terms. Allan Behm is a former head of the International Policy and Strategy Divisions of the Department of Defence. Image courtesy of ASPI 2016.